As the Earth’s average surface temperatures rises, so do the associated costs. Because marginalized communities and groups (e.g., women, immigrants, the elderly, the disabled) are more exposed to climatic risk, the costs of climate change are more difficult for them. Women in particular are structurally vulnerable, and climate change can worsen existing gender-based inequities that keep them impoverished and marginalized. Climate nance (‘financial flows mobilized by industrialized country governments and private entities that support climate change mitigation and adaptation in developing countries’) can catalyse the much-needed transition to zero-carbon and climate-resilient development while also fostering equitable social policy, including gender equality and women’s empowerment. 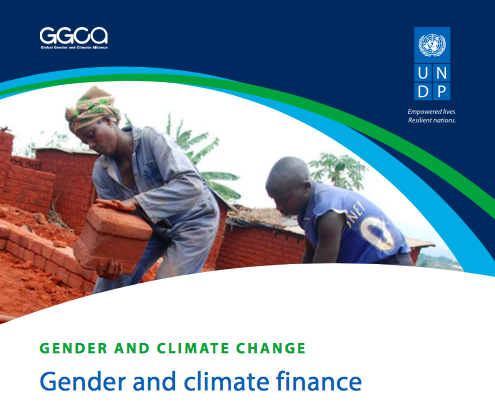 While the recent integration of gender considerations into key multilateral climate nance mechanisms, including the recently operationalized Green Climate Fund, are steps in the right direction, gender considerations have yet to be e ectively mainstreamed in ongoing climate change programmes and activities, and national planning. To enhance the efficacy of supported actions and ensure their long-term viability, hence maximizing the impact of climate finance, existing funding mechanisms across scales need to tackle deeply rooted structural inequities.